In our culture of CAMAraderie, we believe we can empower wellbeing for all by sharing knowledge through synergistic relationships. In 2017, we traveled across the country to volunteer, lecture, learn and offer our wisdom in an effort to inspire next generations of designers, care-takers and innovators. 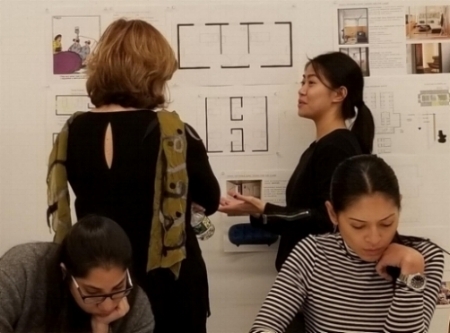 Rosalyn Cama presented her lecture, Empowering Wellbeing Through Design to a number of academic institutions including Parsons School of Design (The New School, NY) and Savannah College of Art and Design (SCAD, GA). For the Fall 2017 semester, Rosalyn provided Healthcare Design webinar lectures for colleague, Debajoti Pati's graduate class at Texas Tech University. Rosalyn presenting at SCAD in September. We were so impressed by the students, faculty and curriculum offered at each institution. The main takeaway for each lecture to academic institutions is to inspire students to innovate by taking risks and to continue to support and develop Evidence-Based Design practices. Rosalyn also presented a similar lecture back in October to the Interior Designers for the New England VA Healthcare System. Rosalyn with the Interior Designers of the New England VA Healthcare System. (Left to Right) Amanda Mewborn (Piedmont), Sheba Ross (HKS), Rosalyn Cama (CAMA), Steve Higgs (CBRE) and Bob Farrow (HKS) at the 2017 Healthcare Design Conference. October 2017. Rosalyn critiquing Parson Design students' work. November 2017. Back in April, Rosalyn attended Cornell University to present on the "Entrepreneurs and Innovators in Health, Hospitality and Design" panel, along with Docent Health and Four Seasons Hotel. The Panel discussed the growing intersection of Healthcare & Hospitality Design through wellness practices. Rosalyn also attended the 2017 Symposium on Sustainability in Healthcare where she spoke on a Panel that addressed the alignment of Evidence-Based Design and Evidence-Based Medicine to design a more efficient and higher quality patient-centered healthcare delivery model. In November, CAMA traveled to Orlando for the Healthcare Design Conference, where Rosalyn spoke on the Piedmont Atlanta Hospital Design Team Panel. The Panel shared best practices on building integrated design & construction teams. Senior Designer, Tanya Paz, was a selected headliner for the AIA|LA Powerful IV Event, held in Los Angeles in October. The event features inspirational and energetic presentations that showcase women who are leading the design profession. Tanya Paz (center) speaking at the AIA/LA Powerful IV Event. October 2017. CAMA Design Coordinator, Ellen Kebabian, attended the ASID CT Design Matters event back in February to hear Jim Mellor of McGuire Furniture offer insight on current and upcoming trends in the design industry. Ellen is an active member of the ASID CT Advisory Board of Directors. Earlier this year, Tanya Paz was chosen by Contract Magazine to showcase some of her favorite products and brands that she has selected in Healthcare design projects. Her showcase is part of an ongoing series in Contract Magazine entitled, Designers Select. Ellen (2nd from left) at the ASID CT Design Matters event. February 2017. Photo Courtesy of Paul Bickford for Landinophoto. As seen in Cottages & Gardens CT.